Welcome back to Movie Night week here on Moms & Munchkins. Today we’re closing out the week with two Movie Night Games – Movie Snack Charades and Popular Cartoon Charades (simply click on the title of each for the free printables). 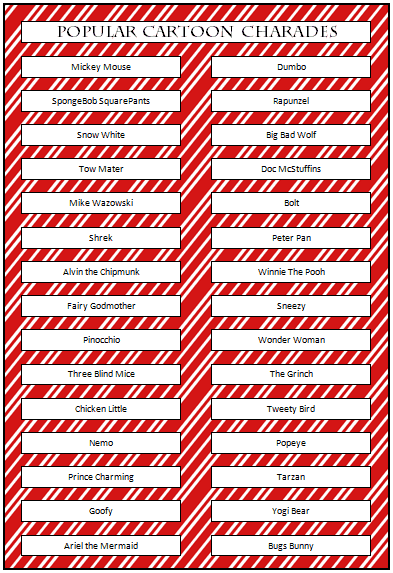 Print the free games and cut out each of the charades (each white rectangle is one charade). Fold these and put them into a pail. Split your group into two teams and decide which team will go first. That team will decide who will act first (don’t worry – everyone gets a turn to be the actor during the game). Team One will then randomly select one charade from the pile and the actor will have 30 seconds to act it out for his/her team. The “actor” is not allowed to speak in charades – he/she can only act silently. If Team One guesses the charade in 30 seconds, they win a point. If they don’t guess it correctly, then Team Two has one chance to guess the correct charade for one point. The game then continues with Team Two randomly selecting a charade and continues with the teams taking turns selecting charades and switching who is acting from each team. 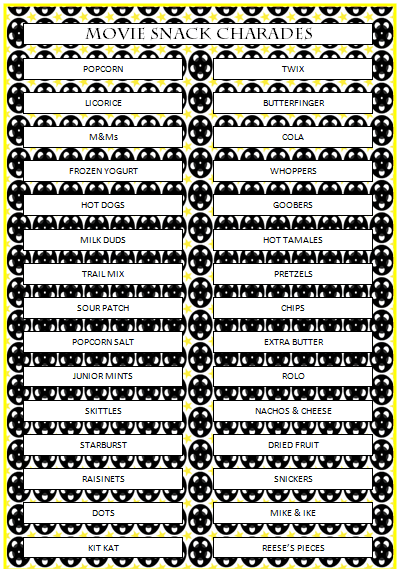 The Movie Snacks game includes a variety of different snacks you’d eat at the movie theatre or at home on family movie night. The Popular Cartoon game includes cartoon characters – some new and some old – for the players to act out and guess. Don’t forget to visit our Movie Night category for even more fun ideas like additional free games, snack ideas, decorating ideas for a movie party and more! Brings back so many memories! Thanks for sharing at After School! What a fun idea! We’re hosting s’more nights every Friday night this summer for whoever can make it. This would be a fun game to play around the fire pit. Thanks for sharing via Family Fun Friday. We haven’t planned charades yet. This would be a good way to introduce the game to my son. Thank you so much for linking this wonderful post up to The Sunday Showcase.